Like other African countries, Ghana is considered a favorable country in terms of running the VoIP GSM termination business, with the high rate (an average of $0.2 per minute) and low tariffs for local calls attracting entrepreneurs. The owner of voip gateways gets the opportunity to make good money landing international traffic in Ghana. The country produces and exports oil, as well as it is the second largest producer of cocoa in the world. Gold, silver and diamonds are also produced here for export. This led to the need for making international calls to Ghana and from Ghana. The main partners in foreign trade are the Netherlands, Ukraine, the USA, Great Britain, and France. By 2020, Ghana is expected to be the most developed country on the African continent. Another source that attracts international traffic into the country is tourism. Foreigners come here from Europe, Asia, South and North to enjoy the mild tropical climate, beautiful wildlife and numerous waterfalls. Due to a large number of calls coming into the country from abroad, entrepreneurs have wide opportunities for business in the voice termination wholesale. In 1992 Ghana had a mobile communication available. The country has become the first on the African continent (Sub-Saharan), which have been actively using cell phones. Today, with a population of 25.4 million inhabitants, mobile penetration is 127% in the country. The amount of international traffic the originator companies offer to land in this country are an average of 50 thousand minutes. This is enough for a stable income doing voice termination wholesale in Ghana. Using a single 16-channel gateway, which will terminate calls for 5 hours each day, the terminator will be able to make a profit of about 19 thousand dollars. At the same time, it is necessary to deduct the cost of local calls and internet services. 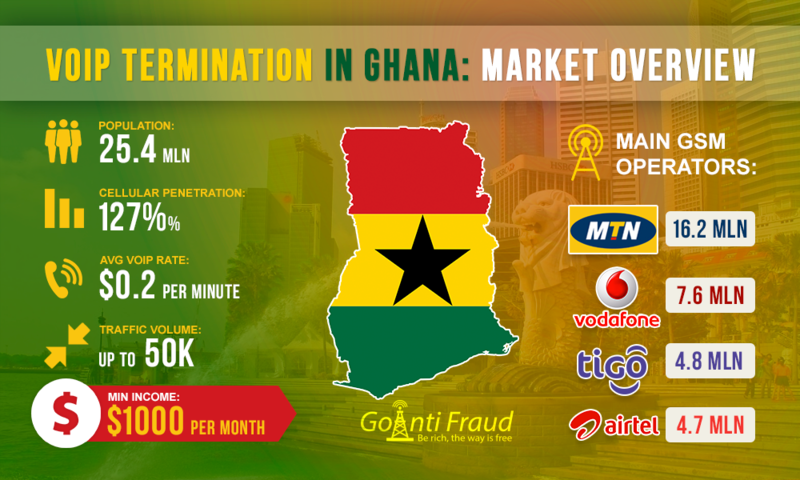 About lucrative packages for GSM termination in Ghana you can read here. To run a successful business in the field of VoIP traffic termination, it is important to minimize blocking of SIM-cards by antifraud systems. GoAntiFraud offers you proven tools to efficiently mask the cards from the GSM operators to prevent the SIM-lock, including the simulation of moving around the city.